At Natural Healing Tools, we are always looking for the best in health! This article underscores the absolute necessity of Omega-3's in our diet. Whole foods are best but if you are seeking quality supplements - check out the Yes EFA supplement created from Dr. Peskin's research. It's is vegan - plant based from Flax Seed. (Harvard School of Public Health) The human body can make most of the types of fats it needs from other fats or raw materials. That isn’t the case for omega-3 fatty acids (also called omega-3 fats and n-3 fats). These are essential fats—the body can’t make them from scratch but must get them from food. Foods high in Omega-3 include fish, vegetable oils, nuts (especially walnuts), flax seeds, flaxseed oil, and leafy vegetables. Most Americans take in far more of another essential fat—omega-6 fats—than they do omega-3 fats. Some experts have raised the hypothesis that this higher intake of omega-6 fats could pose problems, cardiovascular and otherwise, but this has not been supported by evidence in humans. (4) In the Health Professionals Follow-up Study, for example, the ratio of omega-6 to omega-3 fats wasn’t linked with risk of heart disease because both of these were beneficial. (5) Many other studies and trials in humans also support cardiovascular benefits of omega-6 fats. Although there is no question that many Americans could benefit from increasing their intake of omega-3 fats, there is evidence that omega-6 fats also positively influence cardiovascular risk factors and reduce heart disease. 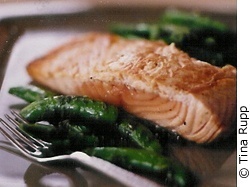 Here’s a delicious way to get your omega-3s: Try Pan Roasted Salmon with Minty Snap Peas. 1. Leaf A. Prevention of sudden cardiac death by n-3 polyunsaturated fatty acids. J Cardiovasc Med. (Hagerstown). 2007; 8 Suppl 1:S27-29. 2. Dietary supplementation with n-3 polyunsaturated fatty acids and vitamin E after myocardial infarction: results of the GISSI-Prevenzione trial. Gruppo Italiano per lo Studio della Sopravvivenza nell’Infarto miocardico. Lancet. 1999; 354:447-55. 3. Yokoyama M, Origasa H, Matsuzaki M, et al. Effects of eicosapentaenoic acid on major coronary events in hypercholesterolaemic patients (JELIS): a randomised open-label, blinded endpoint analysis. Lancet. 2007; 369:1090-98. 6. Leitzmann MF, Stampfer MJ, Michaud DS, et al. Dietary intake of n-3 and n-6 fatty acids and the risk of prostate cancer. Am J Clin Nutr. 2004; 80:204-16. 7. Koralek DO, Peters U, Andriole G, et al. A prospective study of dietary alpha-linolenic acid and the risk of prostate cancer (United States). Cancer Causes Control. 2006; 17:783-91. 8. Eilander A, Hundscheid DC, Osendarp SJ, Transler C, Zock PL. Effects of n-3 long chain polyunsaturated fatty acid supplementation on visual and cognitive development throughout childhood: a review of human studies. Prostaglandins Leukot Essent Fatty Acids. 2007; 76:189-203. 9. Oken E, Kleinman KP, Berland WE, Simon SR, Rich-Edwards JW, Gillman MW. Decline in fish consumption among pregnant women after a national mercury advisory. Obstet Gynecol. 2003; 102:346-51.